As the capital city of Sichuan, Chengdu is a city with many faces. On the one hand this is an incredibly modern and vibrant place. Beijing Sichuanhas a relatively relaxed attitude towards this city and as such, Chengdu has blossomed in terms of affluence and investment. The traditional industries of gold, silver, silk and lacquer ware have helped to make this city one of the most important centers of commerce in the country. Today, skyscrapers dominate the skyline and Japanese cars and western goods are hugely popular and widely available. This modernization has no doubt been helped by the important role that Chengdu plays in terms of education and culture in China. Once one of the most important printing centers in the country, Chengdu has a long history as a destination for learned poets and artists to gather and seek inspiration. The great poet Du Fu, made his home here and today there are 14 colleges and an impressive university situated in the city. Nestled amongst this affluence and development is another side to Chengdu. Traditional wooden Chinese architecture that once dominated this city can still be found in the outskirts although it is fast disappearing. What does still exist here however in abundance, is a great street life. Markets and street hawkers fill the streets dealing in everything you could possibly imagine, from snakes and snails to fortunes and foot scrubs. Arrive in Chengdu, capital city of Sichuan province, the home town of Panda. Picked up by the local guide at airport or train station and transferred to hotel. Wuhou might be translated as "minister or war".That was the title given to ZhugeLiang, a famous military strategist of the tree Kingdoms period (AD220-280) immortalised in one of the classics of Chinese literature, the tale of the Three Kingdoms.the shrine situated in the southern suburb of Chengdu.the Romance of the Three Kingdoms carries out the stories about ZhugeLiang. Reading these stories even in English translation is a great enjoyment. In the morning we will leave for Danba. 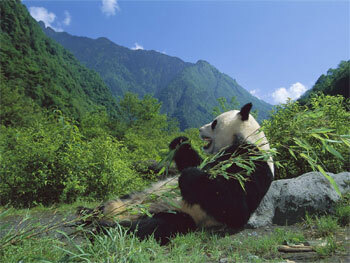 We'll cross the Wolong Giant Panda Reserve, where there are about 50 giant pandas bred in a semi-natural environment. After lunch at Wolong, we cross the foggy Balang Mountain (4,523 meters) and pass by the Siguniang Shan Mountain (four-girls mountain, highest peak 6250 m), late in the afternoon we reach Danba (1900 meters). The local people are called Jiarong (Gyarong) Tibetans. Danba has long been acclaimed as the Kingdom of Thousands of Ancient Blockhouses. Visit the ancient block towers in Suopo. In the afternoon drive to Bamei. Pass by Donggu Scenery Spot (the Natural Bonsai Valley), which is situated at the Donggu Village 21 kilometers to the southwest of Danba County. In the valley, the clear Yak River flows through and numerous varieties of plants are well preserved and the lush and damp forests make it hard to view the sky. Many lakes and hot-water pools at the bottom of the valley create a world of steam.Reach Bamei in the late afternoon. Drive to Garze, the real cultural and religious center for the Tibetans living in Sichuan. In Tibetan "Garze" means "white and beauty", named after the famous temple in the county. On the way have a rest by the Kasa Lake. Upon arrival, visit Garze monastery of yellow sect (Gelug). In the morning pass by Manigango to visit Xinlu Hai Lake (Yilhun Lhatso). Located at the foot of Chola Mountain in Dege County, Xinlu Hai Lake Scenic Spot is 98 kilometers from Garze County and 100 kilometers from Dege County. In the afternoon we visit the Dege Printing House which has always been well reputed as the "Cultural Treasury at the Foot of the Snow Mountain." As the national leading protected entity of cultural relics, it is the biggest printing house in Tibetan area. Drive across the Jinsha River (upper reaches of Yangtze) Bridge connecting Sichuan and Tibet heading for Chamdo. We will cross over no less than four passes: Khargang La (4,352 m), Lashi La (4,450 m), Jape La (4,680 m), and Tama La (4,511 m), with clutters of prayer flags waving in the wind on the peaks and friendly nomads waving at us from the grasslands. Straddling the Mekong river, Chamdo (3200 m) was the former capital of Kham in East-Tibetan area and has a rich history as one of the earliest centers of the Tibetan plateau and home of Kalden Jampaling. In the morning visit Galden Jampaling monastery. In the afternoon drive over the Zholpel La pass (4688 m) to Riwoche (3810 m). After master Tsuri La Pass (4200 m) and Shel La Pass (4750 m) we arrive at Bachen, the "big Yak hair tents". Continue to drive 30 km we reach Sok Dzong. Drive to the Sok Tsanden Zhol village, and visit the monastery of Nyimpa sect - Sok Tsanden Gompa. After that cross over two passes and reach the city of Shakchuka. Still just 100 km and two other passes have to be mastered before arrive at the today's destination Naqu. The northern route of Sichuan - Tibet Highway (Chengdu - Lhasa) and the Qinghai-Tibet Highway (Golmud - Lhasa) meet in Naqu. About 8km west of central Lhasa is the Drepung, once world's largest monastery with about 10,000 monks. This day's sightseeing begins with these white monastic buildings piled up on the hillside. Walking up to the hill is a pleasant thing, an easy break from the solemn ambience inside the halls and chapels. At the plat roof of hillside, you can have very good views of the whole Lhasa city and the distant mountains. Drepung is one of Lhasa's two great Gelugpa monasteries, the other is Sera. Around 5km north of central Lhasa, Sera may not be as grandiose as Drepung, but is more serene surrounded by many small temples. The 'Buddhism Scriptures Debating' in Sera is very famous. Your private guide and the car with driver will see you off to the airport or train station for your onward destination. Your Tour ends.